Today was biology day, and it got off to a cracking start with a talk by world-famous paleontologist Simon Conway Morris. 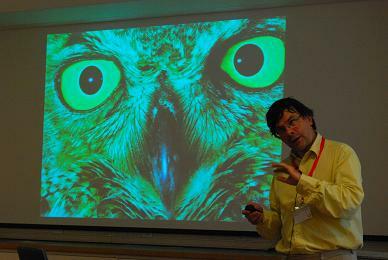 In his talk ‘Evolution and Fine-Tuning in Biology’, Simon concentrated on the phenomenon of convergence – the word used by biologists to describe the fact that some things such as the E-coli motor and the camera eye have evolved not once, but several times, by independent paths from different starting points. In fact, Simon has just a published a well-known book on this topic. This was an astonishing talk for many of us, backed up by irrefutable evidence. The conclusion that biology is far more organized than we suppose seemed inescapable (nothing to do with intelligent design, which Simon strongly criticized in discussion time). Over dinner, I asked him the obvious question from physics – surely nature normally proceeds along the pathway of least energy? His patient answer was ‘Yes, she does indeed, but the starting point was different in each case’. Doh! 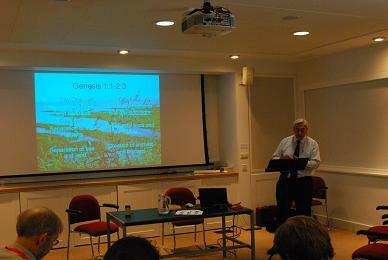 Later in the day, we had two interesting talks on evolution, creationism and intelligent design by Prof Darrel Falk. Apparently, there are 100 million evangelical Christains in the U.S., only 28% of whom believe in evolution at all and less than 6% of whom accept natural selection. Prof Falk spoke of the effort to ‘convince from the inside’ – i.e. the challenge for a thinking theoligian or religious biologist to convince the right wing evangelical community that evolution by natural selection is not incompatible with scripture or their beliefs. Thanks for the followup on the videos. ps., I’m sure you’re aware but I want to let you to know that not all religious denominations in America doubt evolution. Last week I attended the Fides et Ratio seminar in Providence College in Rhode Island. The attendees were for the most part Catholic and no one I met doubted evolution nor the big bang model for the origin of the universe. Some in fact some pointed out how both of these theories have dim, conceptual beginnings in Aristotle’s works. Sure Jim, that’s the point – many mainstream religions see no conflict with Darwinism in their faith, including both the mainstream catholic and protestant church (Aristotle is secular). It is only the fundamentalists that reject Darwinism and the age of the earth..